Learn about the temperament and personality of the Black Russian Terrier. Discover what he's like to live with, his traits and characteristics and how he generally behaves. And look at lots of Black Russian Terrier photos. The Black Russian Terrier is large, intelligent, robust, powerful, protective, and territorial. He loves his family deeply but is aloof and distrustful toward strangers. He is a good watchdog, and doesn't usually bark unless there's a reason. He is born with an instinct to guard and protect, and he will protect your family, yard, house, and vehicle. Just his appearance alone might thwart intruders. He is confident and courageous. He will instantly become defensive in dangerous situations, but relaxes as soon as the danger passes. Because of his size, strength, and dominant nature, early obedience training is really important. He is alert and responsive and adapts well to training. This dog needs lots of human companionship, and will want to be part of the family. He will want to be with you at all times, following you from room to room and sharing your life. They love to go for rides, so you might need to get a bigger vehicle. Some BRTs want to be touching their owners at all times, just so they know they are still there. They will want to sleep with you and they love to give big, wet, sloppy kisses, especially when you are in a deep sleep. Not that you'll get much sleep because they also snore like chainsaws. They will develop behavioral problems if they get lonely. They need daily exercise and love to hike, swim and jog. They excel in obedience and agility competition. They are excellent jumpers. They are wonderful with children and like to lick leftovers off their faces. BRTs are very gentle and quite tolerant of ear and tail pulls. Just be sure you don't let your toddlers try to ride them like a horse. Their beards get quite wet, especially if they've just had a drink. They can spray water on your walls and ceilings. And they always love to snuggle, whether or not their beards are wet. They can do well with other pets, but two unaltered males in the same household will want to dominate each other. The Black Russian Terrier is a determined, fearless, and deeply devoted dog. With proper socialization and training, he can be an excellent companion. 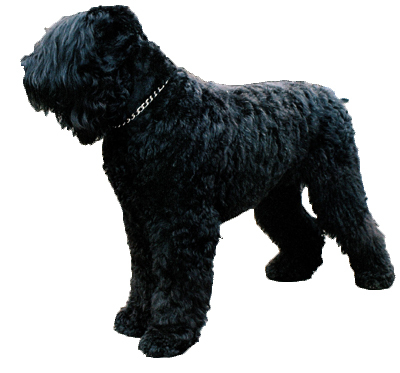 The Black Russian Terrier is intelligent and quite easy to train. He learns new commands quickly at an above average rate. The Black Russian Terrier sheds practically no hair at all. You'll virtually never find a hair in your home!